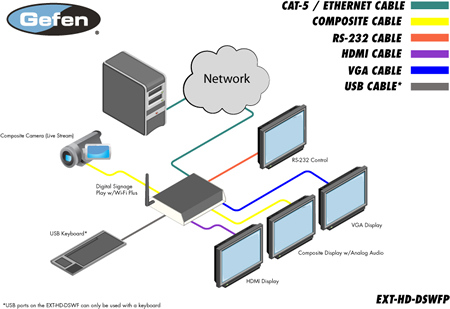 The Gefen EXT-HD-DSWFP and Digital Signage Player with Wi-Fi Plus is a simple-to-operate media player which includes software, live video input, and RS-232 functionality. 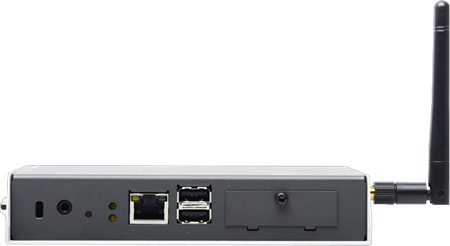 Live video can be directly injected into your Digital Signage application using the composite video input included on the device. With this feature, users can overlay content and place the video into one of four quadrants for more sophisticated Digital Signage systems. The all-metal enclosure features a passive cooling system. The product comes with 4 GB of built-in flash memory and the securable compact flash card slot allows the addition of up to 16 GB of memory if needed (replacing the internal storage). Two integrated USB 2.0 ports provide connection to a keyboard and USB storage devices. Support for over 20 different media formats provides a wide selection for content creation. Connect composite video sources such as cameras and media players. A watchdog timer lets the product recover and resume playback after power and network disruptions. The included software will allow users to upload video playback schedules and playlists for easy content management. Additionally, software developers can utilize W3C SMIL (Synchronized Multimedia Integration Language) syntax which ensures compatibility across multiple Digital Signage platforms. The included software features over ten different multi-zoned templates to fit your specific Digital Signage needs. 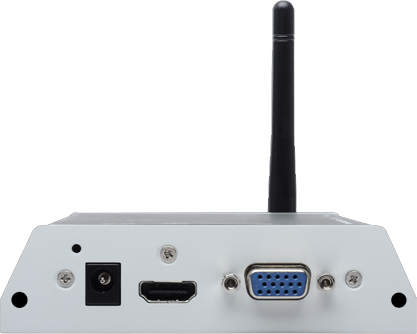 The Digital Signage Player with Wi-Fi Plus connects to a display using analog (Composite / Component / VGA) or an HDMI cable. There are two options for connecting to the network: 1) Connect an Ethernet cable to the network, or 2) Connect using Wi-Fi. Then, connect a keyboard and peripherals to the USB ports to configure the unit. Use the included Composite A/V cables to connect the product to the 3.5 mm connector. Connect the 12 V DC power supply to the unit and connect the AC power cord to an available electrical outlet.